I get the error "Cannot initialize scanner : Modules mapping directory not found " when I start the ESET file security. I have a Linux server with the OS SLES-12.4 installed on it. From a freshly installed Linux, I just install the glibc-locale-32bit and then I install the esets.x86_64.rpm.bin (version 4.5.11). And I get the error "Cannot initialize scanner : Modules mapping directory not found ". Do you know what sould I do to fix this bug? And I get the error "Cannot initialize scanner : Modules mapping directory not found﻿ ". May I ask why are you installing 4.5.11 when 4.5.13 is available? - I would suggest to uninstall previous version and make clean install of version 4.5.13 and check if issue persist. Due to a project constraint, I have to use the 4.5.11. Before, we were installation this version of ESET on SLES 12.3 and it was working well. 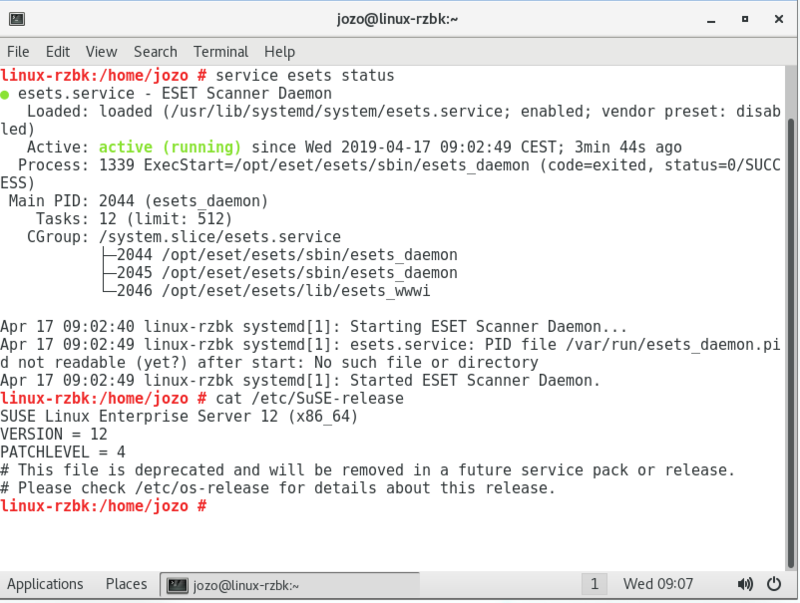 We have recently moved to SLES 12.4 and we now get this error when starting the esets service. I checked it at my SLES 12.4 and ESET File Security works for me. I find the cause of the issue. It is that Apparmor is enabled by default at SLES 12.4. It is needed to disable Apparmor completely and reboot the system and than install ESET File Security and it works as expected. If I understand well, ESET and apparmor cannot be run together?